Koen W.A. van Dongen received his M.Sc. degree in experimental physics from the Faculty of Physics and Astronomy at Utrecht University, The Netherlands, in 1997. From 1998 to 2002, he worked as a scientist on the design of a directional borehole radar system for the geophysical survey company T&A Survey in Amsterdam. In 2001, the system won the Wall Street Journal Innovation Award and in 2002, his research resulted in a Ph.D. degree in technical sciences from the Delft University of Technology, Delft, The Netherlands. During 2002 and 2003, he worked as a postdoctoral researcher in the Laboratory of Electromagnetic Research, Faculty of Information Technology and Systems, Delft University of Technology. This project concerned the imaging of buried objects using electromagnetic wave fields. 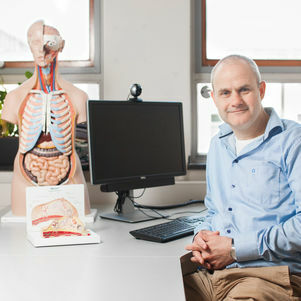 From 2003 to 2005, he used his Marie-Curie Intra-European fellowship to work on non-invasive thermometry during hyperthermic cancer therapy using ultrasound in the Ultrasonic Research Group, Department of Electrical and Electronic Engineering, University College Cork, Ireland. In 2006, he returned to the Delft University of Technology as an Assistant Professor in the Laboratory of Acoustical Imaging and Sound Control in the Faculty of Applied Sciences. His major research interest is in medical acoustics, and specifically in imaging, inversion, and modelling of nonlinear ultrasonic wave fields in inhomogeneous media for medical applications. Koen W.A. van Dongen, "A directional borehole radar system for subsurface imaging". Ph.D. dissertation, Delft, The Netherlands, 2002, Delft: Delft University Press, ISBN 90-407-2310-9. M.D. Verweij, K.W.A. van Dongen, NL2000760 (C2), "Werkwijze voor het niet-invasief meten van een temperatuur in levend weefsel," 20 Jan. 2009. M.S. van Oers, K.W.A. van Dongen, P.M. van den Berg, J.T. Fokkema, R. van Ingen, N.V. Budko, R.F. Remis "3-D borehole radar antenna and algorithm, method and apparatus for subsurface surveys," US2003089494 (A1), 15 May 2003. R. van Ingen, M.S. van Oers, K.W.A. van Dongen, P.M. van den Berg, J.T. Fokkema, "Borehole radar tool for locating transitions or fractures in geological formation, includes transmitting and receiving antennas and reflector section extending near wall of housing," NL1015651 (C2), 24 Jan. 2002. A.B. Ramirez and K.W.A. van Dongen, "Sparsity Constrained Contrast Source Inversion", Journal of Acoustical Society of America 140(3), 1749-1757, August 2016. N. Ozmen, R. Dapp, M. Zapf, H. Gemmeke, N.V. Ruiter and K.W.A. van Dongen, "Comparing different ultrasound imaging methods for breast cancer detection", IEEE Transactions on Ultrasonics, Ferroelectrics, and Frequency Control 62(4), pp. 637-646, April 2015. K.W.A. van Dongen and W.M.D. Wright, "A full vectorial Contrast Source inversion scheme for 3D acoustic imaging of both compressibility and density profiles", Journal of the Acoustical Society of America, vol. 121, no. 3, pp. 1538-1549, March 2007.